Remove the transmission range selector lever cable. Refer to Range Selector Lever Cable Replacement. Disconnect the control valve body transmission control module electrical connector (1) then unclip the connector from the transmission. 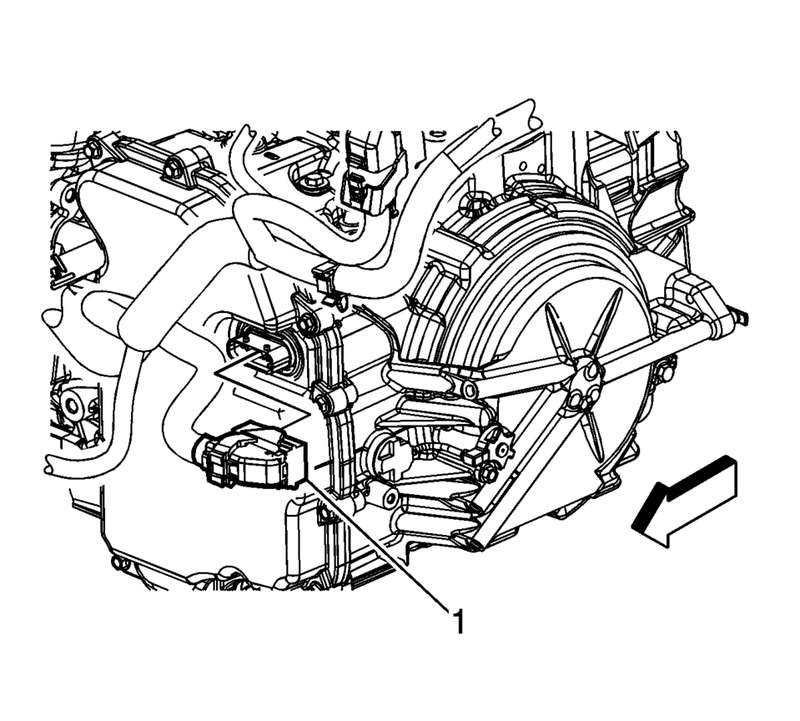 Remove the transmission fluid cooler inlet hose from the transmission. Refer to Fluid Cooler Inlet Hose Replacement. Remove the transmission fluid cooler outlet hose from the transmission. Refer to Fluid Cooler Outlet Hose Replacement. Plug and/or cap the pipes and transmission to prevent contamination. 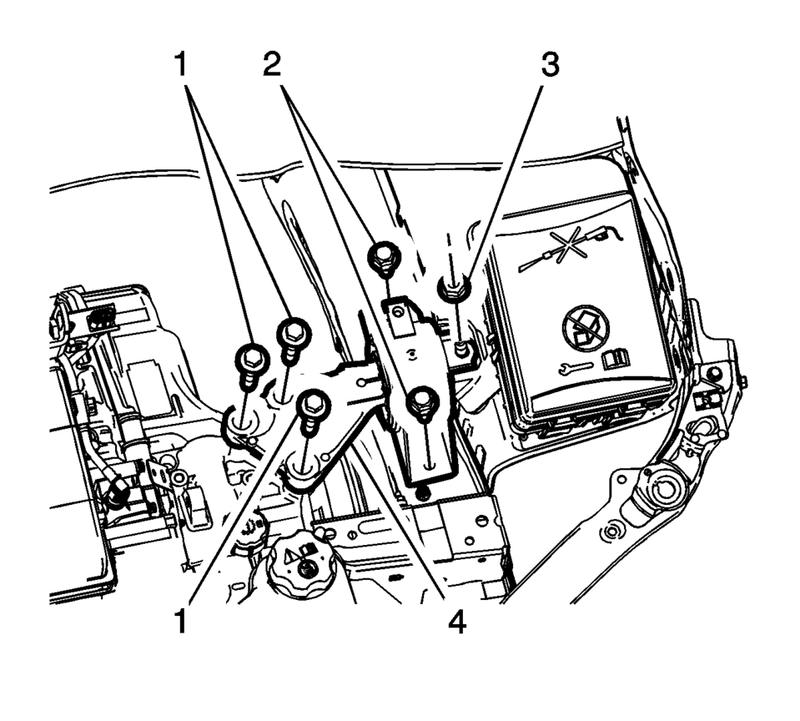 Remove the upper transmission to engine bolts (2). Install the support fixture. Refer to Engine Support Fixture. Drain the transmission fluid. Refer to Transmission Fluid Drain and Fill. Remove the front wheel drive shafts from the transmission. Refer to Front Wheel Drive Shaft Replacement. Remove the starter motor. Refer to Starter Replacement. Remove the hole cover (1) and the torque converter to flywheel bolts (2). Remove the drivetrain and front suspension frame. Refer to Drivetrain and Front Suspension Frame Replacement. Remove the rear transmission mount bracket from the transmission. Refer to Transmission Mount Bracket Replacement - Rear. 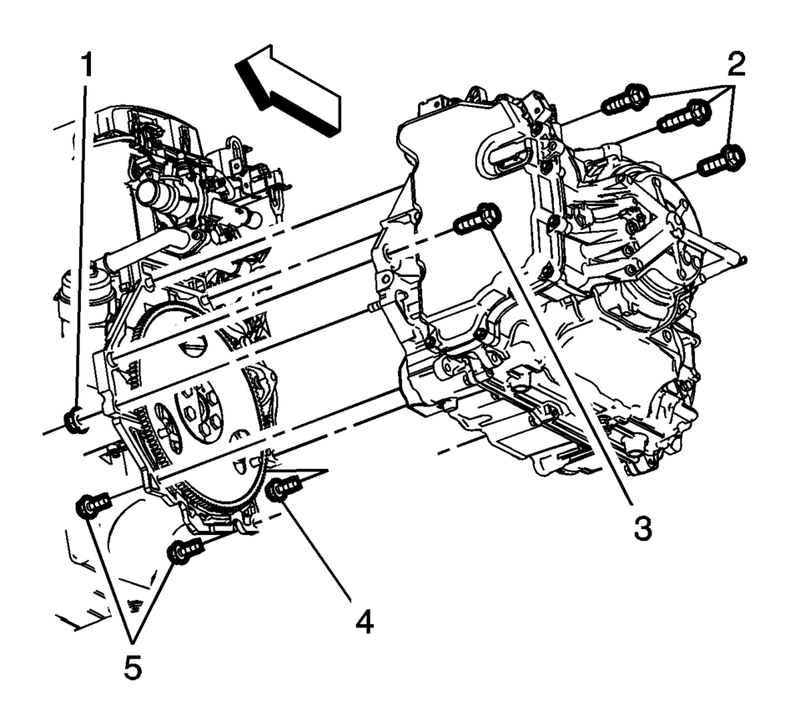 Remove the left transmission mount (4). Refer to Transmission Mount Replacement - Left Side. Use a transmission jack in order to support the transmission. 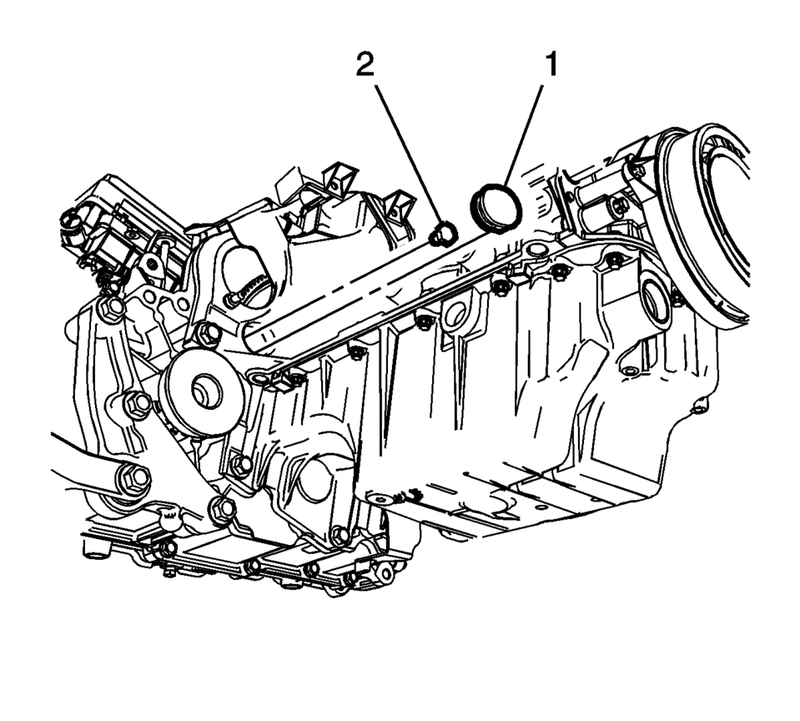 Remove the lower transmission fasteners (1, 3, 4, 5). Ensure the torque converter remains securely in place on the transmission input shaft while separating and removing the transmission. Lower the transmission with the transmission jack far enough to remove the transmission. Flush and flow test the transmission oil cooler and lines. Refer to Transmission Fluid Cooler Flushing and Flow Test. Raise the transmission with the transmission jack and position the transmission to the engine. Install the left transmission mount (4). 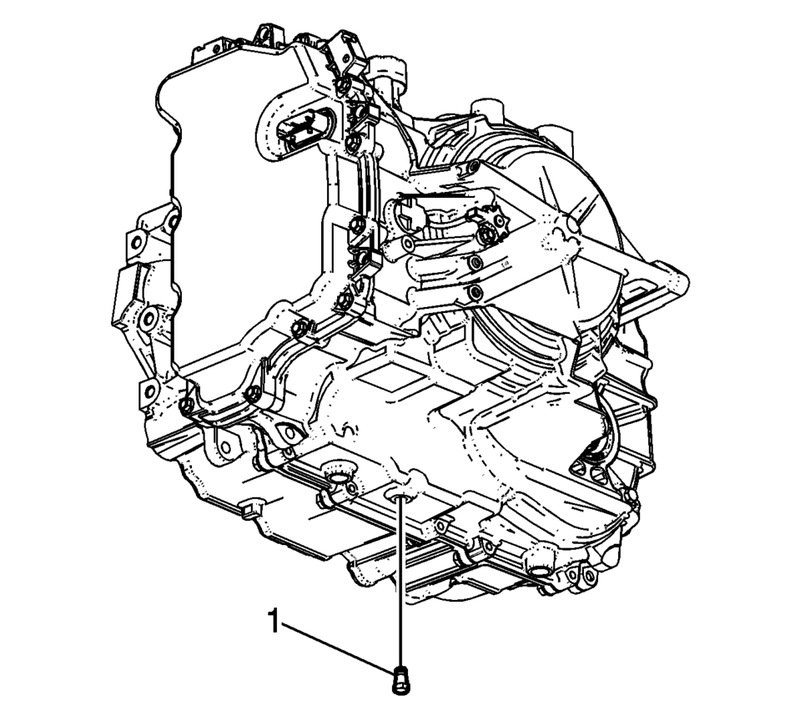 Refer to Transmission Mount Replacement - Left Side. Install the rear transmission mount bracket to the transmission. Refer to Transmission Mount Bracket Replacement - Rear. Install the drivetrain and front suspension frame. Refer to Drivetrain and Front Suspension Frame Replacement. If reusing the torque converter bolts, clean the threads and apply threadlocker to the threads prior to installation. and install the hole cover (1). Install the starter motor. Refer to Starter Replacement. Install the front wheel drive shafts to the transmission. Refer to Front Wheel Drive Shaft Replacement. Remove the support fixture. Refer to Engine Support Fixture. Connect the control valve body transmission control module electrical connector (1) then clip the connector to the transmission. Install the transmission fluid cooler outlet hose to the transmission. Refer to Fluid Cooler Outlet Hose Replacement. Install the transmission fluid cooler inlet hose to the transmission. Refer to Fluid Cooler Inlet Hose Replacement. Install the transmission range selector lever cable. Refer to Range Selector Lever Cable Replacement. Install the radiator surge tank. Refer to Radiator Surge Tank Replacement. Fill the transmission with fluid. Refer to Transmission Fluid Drain and Fill. If a NEW transmission control module (TCM) has been installed into the vehicle, the NEW module needs to be reprogrammed. Refer to Service Programming System (SPS). Perform the transmission adaptive values learn. Refer to Transmission Adaptive Values Learn.